It just goes to show that you should always keep your device drivers up to date! That was my task this lunchtime. Having installed the drivers that came with my Creative Sound Blaster X-Fi Platinum everything appeared to be working fine. Listening to music in WinAmp everything sounded lovely: responsive, crystal clear and other phrases that you might read in a Hi-Fi magazine. 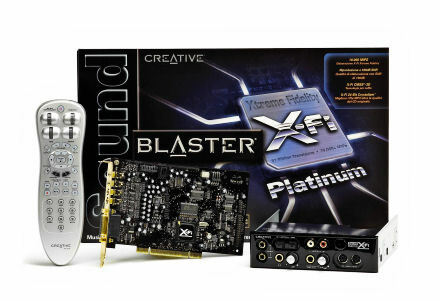 Battlefield 2 benefits from super-accurate sound placement, stunning audio quality, and powerful audio acceleration when you have a Sound Blaster X-Fi in your system. I fired up BF2, clicked on the Options page and selected Creative X-Fi as my audio renderer (the other options were ‘software’ or ‘hardware’) clicked Apply and I was dumped rather unceremoniously back on my Windows desktop. A couple more attempts resulted in exactly the same response. After a quick search online for a solution, I headed over to the Creative Support website and downloaded the latest drivers and installed them. A device driver, often called a driver for short, is a computer program that enables another program, typically, an operating system (OS) (e.g., Windows, Linux, FreeBSD) to interact with a hardware device. A driver is essentially an instruction manual that provides the operating system with the information on how to control and communicate with a particular piece of hardware. In layman’s terms, a driver is an important, vital piece to a program application; the main ingredients of the system. So, it should be fairly obvious then, if your device drivers are out of date then you can’t expect everything to work as well as it should. What I do wish, however, is that Creative improved the information on its website about its latest drivers and applications. It’s not the most intuitive of layouts for those of us who simply want to download the latest files and update our systems. While the ATi Radeon support site presents one file (the latest one) the Creative site has a list of umpteen files. Do I download both driver updates, 0003 and 0004? Or are the updates from 0003 also contained in 0004? Who knows, because it doesn’t make this clear! Rant over. I downloaded 0004 file in the hope that it did contain the 0003 updates too. Installed. Rebooted, so that Windows could load these newly updated files as it started up, and ran BF2 again. I can happily report that this time BF2 was willing to accept the X-Fi settings and that the sound quality is incredible. Sitting at my desk, with my 6.1 surround sound speakers about me it feels as though I’m emersed in the game environment. I can hear computer generated characters moving about behind me. The sound of my character’s feet walking or running on gravel sounds remarkably different to when my character is walking on grass, or tarmac. BF2 is a game that makes me nervous anyway, it’s an all-action FPS with alot going on. Now there is so much more information from the sound that it makes the game so more immediate and intuitive. I’m still not very good at it, however.